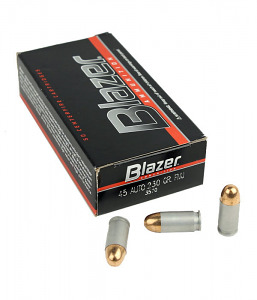 Great ammo at a great price!shipped fast! Live in Florida and had to pay sales tax even though the company is in Ohio. Otherwise I would have given 5 stars! Great deal on some great ammo! Burns clean, snd cycles well. Thanks CCI Blazer, and Top Gun supply.Will be back for sure! Always get the best service from Top Gun Supply. As for the Blaser 230 grain 45 acp ammunition, it’s very good ammo at a reasonable price. Will definitely purchase more in the future. Thanks Top Gun Supply. What can I say. Best price on Blazer Aluminum by far. I don't know how my new HK Elite will like it, but my USP .40 loves Blazer 165 grn fp. No it's not serious target ammo, but it's great for practice. Clean and efficient. Top Gun had it shipped next day and it arrived in three days. Happy customer. A+ seller fast shipping best price.